Since the moment the brand was founded by Amar Bose in 1964, it has shown to aim for nothing less than perfection. This is exactly why the successes of this brand are infinite and beyond everyone’s expectations. In this Bose 301 review we will tell you everything there is to know about this incredible pair of speakers. Bose does create sound that perfectly mimics a concert hall, so you shouldn’t expect anything but optimal performance. That’s true regardless of the material, the sound-field, or artist on the recording. Falling into the “Under $500” category, let’s see if the sonic performance of the Bose 301 is one for you. For some, the greatest thing about the Bose 301 may be its horizontal design, made to perfectly fit on any home bookshelf. It’s equipped with incredible automatic circuitry protection, making it one of the safest speakers you can have. Just as it’s a pro for some, it will be a con for others. Although the style appeals to many, I personally prefer the traditional vertical bookshelf speaker. What we didn’t like about the Bose 301 is the maintenance it requires. You will probably need to clean the panels every month or so and thu risk damaging the speaker and its longevity. Some of the first things that we need to mention in our Bose 301 review is the overall sound quality and amazing performance of these speakers. You cannot help but notice the incredible stand-out horizontal design. That’s by no accident, and not just to stand away from the monotonous designs we’re used to seeing. It actually server a purpose and makes the 301 fit on any bookshelf that lacks height. In addition, they have a very nice spatial dispersion speaker lens. This feature ensures that you have a high-frequency and smooth spatial response. In addition to this, this lens is what makes them perfect for all room sizes, as it ensures a wide distribution of sound. Sound distribution is fairly evenly spread throughout most corners of the room. With the 301, you can expect to hear perfect tones, regardless of where you are standing. Moreover, the design of the 301 is very sleek. With minimally rounded corners and touches of matte design, it will add a piece of sophistication into your room. It also looks quite luxurious, so you will have a modern home without actually overpaying for a pricier bookshelf speaker. Lastly, in terms of sound quality, there is one thing we won’t forget. The Bose 301 makes you feel as if you are really in the room with the artist themselves. It produces clean and clear sound, with no distortion whatsoever. It is undoubtedly one of the best bookshelf speakers we’ve taken a look at at this price point. There are certain features that differentiate the Bose 301 from other, similarly-priced bookshelf speakers. 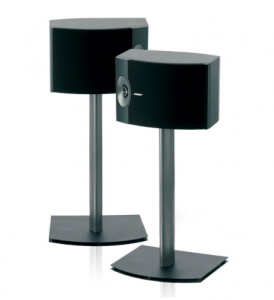 For instance, the 301 offers exceptional performance because it comes with a front left and right speaker. Also, considering the bass reflex design, you can surely expect that the Bose 301 will have very high impact. The speakers are small and don’t take up a lot of space, however they will surprise you with the sound they produce. Coming at only 9.75 x 14.25 x 9.75 inches, these speakers will bring your home theater or listening space to life. They work with power sources of 10-150 watts and they have receivers ranging from 4 to 8 ohms. In addition to all this, they have a removable grill which improves the overall look of the speakers. Moreover, their long-excursion 8-inch woofer ensures that you have powerful low frequencies and clean high ones. More importantly, these speakers are remarkably safe. They feature automatic circuitry protection which prevents the drivers from overdrive. This feature also makes sure that you can rely on them, without heat interfering with the audio experience. We will end our Bose 301 review by saying what we have already heard from other 301 buyers so far and their overwhelming feedback is that coming at this price, these speakers are a steal! They offer a ton of remarkable features and high end components, while keeping you within budget. They are Bose, after-all! 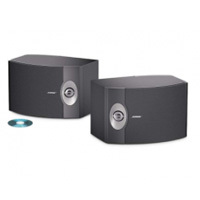 Why not check out the Bose 301 on Amazon and see the reviews from other buyers?